Indianapolis, November 28, 2018 - Copper Mountain Technologies' (based in Indianapolis) and Compass Technology Group are pleased to announce their new Epsilometer solution for measuring the dielectric properties of materials. This solution measures dielectric substrate materials at frequencies from 3 MHz up to 6 GHz and can accommodate sheet specimens 0.3 to 3 mm thick. Dr. John Schultz of Compass Technology commented, "Unlike previous dielectric analysis technologies, this new method uses computational electromagnetic modeling to invert the dielectric permittivity and loss. This represents a significant advance over conventional methods, which use analytical approximations and are limited to frequencies below 1 GHz." 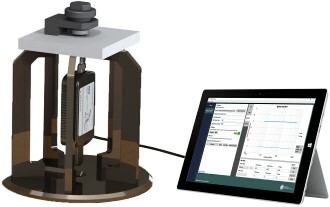 With the launch of Epsilometer Copper Mountain Technologies delivers another solution that combines its metrology-grade portable network analyzers with subject matter expertise to solve important industry problems. CMT CEO Irena Goloschokin stated, "Accurate determination of dielectric properties of radomes, packaging, and microwave substrates is important for design of functioning wireless devices for the Internet of Things and emerging 5G applications." Compass Technology Group (CTG), LLC, was founded in 2011. Based in Alpharetta, GA CTG is a leading provider of cutting-edge research and manufacturing in the radio frequency materials characterization arena. CTG's off-the-shelf and custom-designed materials measurement systems are a combination of innovative hardware such as the Advanced Microwave Mapping Probe (AMMP) and sophisticated specialty software, CTGcalc™, with powerful, efficient and easy-to-use algorithmic and graphical processing tools for measuring S-parameters and extracting material properties such as thickness, epsilon and mu. CTG offers a wide range of products from focused beam measurement systems to tabletop and handheld tools, many of which have been integrated into automated robotic systems. CTG is a certified woman-owned small business. Copper Mountain Technologies develops innovative RF test and measurement solutions for engineers all over the world. The company was created in 2011 and is based in Indianapolis, IN with sales offices in Singapore and Miami. Copper Mountain Technologies provides a broad range of USB vector network analyzers, calibration kits, and accessories for 50 Ohm and 75 Ohm impedance. CMT VNAs are used for RF and Microwave applications from 9 kHz to 110 GHz by engineers in industries like defense, automotive, materials measurement, medical, broadcasting, and telecommunications. CMT customers range from government and defense agencies and contractors, like NASA, United States Armed Forces, Canadian DoD and law enforcement, to universities, mid-size manufacturers, like Reactel and PCTEL, and small companies with just a few employees.